Because they play such a big role in terms of the way a kitchen looks and functions, it's important to make thoughtful decisions about them—from the materials and colors to the scale and layout. 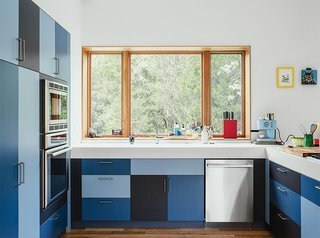 Whether you're looking to build some colorful cabinets or want to install a clever, hidden storage system, these examples will inspire you before embarking on your kitchen remodel. Go bold by painting your cabinet doors different colors. In this Tennessee home, laminate kitchen cabinets in three shades of blue and a Corian top in Glacier White completes a fun and modern composition. Try using the same finish on your kitchen cabinets, walls, and ceiling. This creates an effect that allows everything to blend in seamlessly with the rest of the home. 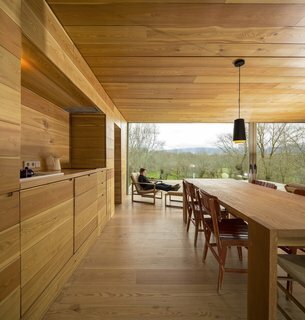 Case in point: this home employs a consistent wood palette. If you don't like handles sticking out from your cabinet doors, one clever idea is to have a hole drilled near the top of the cabinet door so that you can stick you finger in and pull the door open. 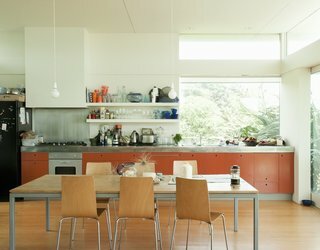 These orange-painted MDF cabinets in a New Zealand beach house show how this technique can work brilliantly in cheery, low-key kitchen. 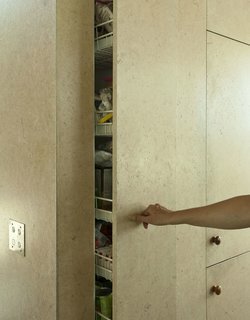 Blending in with the fiberboard walls, the MDF doors in this kitchen hide a pull-out storage system that serves as a kitchen pantry. This 40-year-old, mahogany-paneled kitchen system from Poggenpohl was salvaged in a quirky, 1970s London home. Poggenpohl is the world’s oldest kitchen brand, and this model comes with pocket doors that slide up to reveal shelves for dishes and glassware. Mixing materials and finishings can add visual and tactile variety to your kitchen. Architect Janet Bloomberg combined a dark concrete counter with candy-colored kitchen cabinets and particleboard walls to create a cool, midcentury-inspired look. 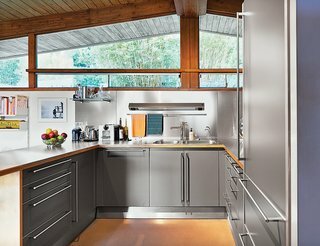 Stainless-steel cabinets, such as these ones by Bulthaup, can give kitchens a no-nonsense, industrial feel. Stainless steel also reflects light, which can help brighten up your kitchen. If you're a minimalist, you may prefer hingeless track doors over swinging doors with handles. 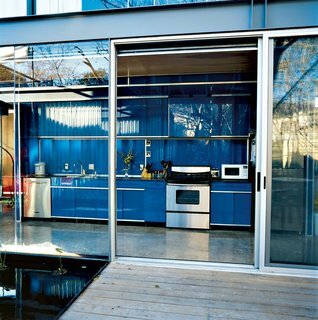 In this steel-frame Texas home, the bright blue galley-style kitchen has no visible hinges, which makes it look like it's one with the similar-colored back wall. 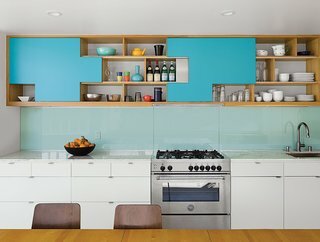 In this Palm Springs duplex, the architect-owner got creative with the cabinet doors by designing aqua blue plywood sliders that park at specific positions, fitting together like puzzle pieces. Contractor Franklin Pineda custom-built the cabinets using Baltic birch plywood from Anderson Plywood.